Westminster City Council consults us on every planning application for the area, approximately 1,000 applications annually. We encourage all developers to engage with us at the earliest opportunity before any pre-application meetings. We ask that developers and owners give careful regard to the impact their proposal will have not only on the historical or architectural interest of the building, but also on the environment, streetscape and the amenity of neighbours. Generally, we do not object to proposals which have architectural merit, where materials and detailed design take into account and enrich original features and are in proportion to the existing building and streetscape. See our planning guidelines. If you disapprove of any development application, please read our guide to objecting effectively. It is important that you make your views known directly to Westminster City Council, as it is them who determine all planning applications. 9 DEVONSHIRE MEWS SOUTH 18/00173/FULL/PP-06597409 Demolition of existing building and erection of replacement dwellinghouse (Class C3) over ground, first and second floor levels with integral garage and roof terrace at rear second floor level. Comment: The proposed front elevation is too ‘busy’ with a mixture of light brickwork, darker brickwork courses, render panels, oak lined window reveals and brickwork ‘shutter effect’ either side of the windows. Traditional mews houses are more utilitarian and use a simpler pallette of materials. The 1st floor windows are too small and ground floor fenestration too low in comparison to neighbouring buildings. 67 HARLEY STREET 18/00220/FULL/PP-06652488 Deletion of Condition 7 of planning permission dated 20 December 2017 (RN: 17/09838/FULL) for, 'Insertion of a window in the side wall at ground floor level and replacing a door at the rear'; NAMELY in order to allow the use of the rear ground floor flat roof as a terrace. 1-2 WELBECK STREET 17/11372/FULL/PP-06628218 Use of sub-basement area, third, fourth and fifth floors of 1-2 Welbeck Street as dual / alternative use as office (Class B1) and/or medical use (Class D1), installation of a single storey storage, plant and cycle provision enclosure in the rear courtyard, and plant to the roof and to the rear elevation. 7 BEVERSTON MEWS 18/00246/FULL/PP-06658071 Erection of a single storey mansard roof extension to provide addition residential accommodation in connection with the existing single family dwelling (Class C3). 105 GREAT PORTLAND STREET 18/00302/FULL/PP-06667955 Use of the ground and basement floors as educational premises (Class D1) for a period to 31st December 2032. 85 MARYLEBONE HIGH STREET 17/10831/FULL/PP-06571349 Erection of a mansard roof extension to create a new two bedroom maisonette at third and fourth floor level. Declaration of Interest - The Association would like it noted that a member of their planning panel has links with this application. This member has not been involved in making the submission below. 50 WEYMOUTH STREET 17/10719/FULL/PP-06556621 Erection of a mansard roof extension at rear second floor level to the Beaumont Mews elevation of the building to create 3 no. self contained units (Class C3) in connection with infilling the lightwell to the rear at ground and first floor level for residential use (Class C3). 62-64 BAKER STREET 17/10950/FULL/PP-06598309 Use of ground floor and basement as mix use retail (Class A1) and leisure (Class D2). Installation of new shopfront. Comment: Although the proposed loss of Class A1 retail would fail to comply with policy the proposals do seek to retain the active frontage and the Planning Statement and Marketing Report demonstrate the difficulty of attracting tenants for an A1 use. There is some contradiction within the documentation as to whether the applicant seeks approval for detailed design of the shopfront, signage, or use of the highway for external seating. Comment: We have concerns over amenity to the 2no. flats proposed at basement level. Both flats appear to have access to the covered space labelled Courtyard - 1. Whether this is to be a shared space or proposed for use by one unit it would cause privacy issues between the two flats. The ventilation strategy is unclear as windows appear to open into the covered space of Courtyard 1. Daylight/sunlight levels within the flats are likely to be poor due to the reduced dimensions of the courtyards and number of internal rooms. 14 HALLAM STREET 17/10857/FULL/PP-06591503 Dual/alternative use of the basement, ground, 1st, 2nd, 3rd and 4th floors as either office (Use Class B1) or medical consulting rooms (Use Class D1). 13-15 PORTLAND PLACE 17/10815/FULL/PP-06533829 Use of the building for a temporary period of 20 years as a medical use (Use Class D1) personal to OM Tower LLP. 8 RODMARTON STREET 17/09979/FULL/PP-06457666 Installation of replacement roof in natural slate with lead detailing and new roof light and installation of replacement windows. 50 JAMES STREET 17/09414/FULL/PP-06467463 Increase in height of the existing butterfly roof by 0.5m, replacement of existing roof light on the rear flat roof, and installation of new windows throughout the property. 37 MARYLEBONE HIGH STREET 17/09841/FULL/PP-06513427 Demolition of the existing roof to create a mansard roof extension and erection of rear extension at rear third and new fourth floor level to extend the existing residential unit at third floor level to provide a two bedroom flat at third and new fourth floor level. 12 BINGHAM PLACE 17/09967/FULL/PP-06462012 Erection of a mansard roof extension to provide additional residential floorspace to the existing flat (Class C3) at first floor level, and associated works. BASEMENT AND GROUND FLOOR 22 ST CHRISTOPHER'S PLACE 17/10807/FULL/PP-06581269 Dual/flexible use of the basement and ground floor for either Restaurant/Cafe(Class A3) use or a drinking establishment (Class A4). • That the applicant measure to ensure that soundproofing shall be provided to ensure that dwelling houses, flats and rooms for residential purposes sharing a party element with the premises to which this application relates shall receive appropriate sound insulation. BASEMENT FLOOR AND GROUND FLOOR 12-14 WIGMORE STREET 17/10044/FULL/PP- 06526565 Use of part of the ground floor as occupation as flexible retail / commercial floorspace (Use Class A1/A2). 83A MARYLEBONE HIGH STREET 17/09780/FULL/PP-06458674 Erection of a mansard roof extension at fourth floor level to create a new 2 bedroom unit. (Part of a land use swap with 142-146 Harley Street and 32-34 Park Crescent Mews West). 89 MARYLEBONE HIGH STREET 17/09781/FULL/PP-06477756 Erection of a single storey mansard roof extension to create a new 2 bedroom flat at 3rd and 4th floor levels of 89 Marylebone High Street and a new 3 bedroom flat at 4th floor level at 90-92 Marylebone High Street (part of a land use swap with 142-146 Harley Street and 32-34 Park Crescent Mews West). Whilst the design of the canopy itself would be an improvement over the existing the extensive lighting would distract from views towards Marble Arch from Great Cumberland Place. Access steps have restricted headroom (which may not meet building regulations). Kitchen use will generate significant humidity which cannot be adequately ventilated. No Objection: The proposed development aims to reinstate the listed building to its original use and layout and to provide a high quality family sized dwelling that will ensure the maintenance and future use of this historic building. It is therefore supported. 14 SHERLOCK MEWS 17/09151/FULL/PP-0655532 Variation of Condition 1 of planning permission dated 23 June 2015 ( RN : 14/10743/FULL) for, 'Demolition of rear facade of Nos. 96-98 Baker Street and front and part rear facades of No. 14 Sherlock Mews, use of first to fourth floors of Nos. 96-98 Baker Street as eight residential flats (Class C3), amalgamation of flats at first and second floors of No. 14 Sherlock Mews into a maisonette (Class C3), erection of replacement shopfronts to Baker Street facade, erection of replacement rear facade to Nos. 96-98 Baker Street, erection of replacement front facade to No. 14 Sherlock Mews, alterations at roof level, and other associated external alterations'; NAMELY, to incorporate the retention of 5 no. windows and 1 no. door, the enlargement of an existing door and a new arrangement of the inner yard to allocate private amenity space and access to the 3-bedroom maisonette rendering it a double aspect unit. CUMBERLAND HOTEL GREAT CUMBERLAND PLACE 17/09103/FULL/PP-06334881 External alterations including replacement of a canopy at the Great Cumberland Place entrance, the reinstatement of windows and insertion of windows along Great Cumberland Place facade, replacement of entrance at Bryanston Street and Great Cumberland Place, replacement of canopy at Bryanston Street and enclosure of existing entrance lobby area at Great Cumberland Place through the relocation of doors along the building line. Objection: Although the applicant states that the design proposals have responded to the pre-application advice they do not address the concerns over illumination of the canopy and signage. 35 NOTTINGHAM PLACE 17/09218/FULL/PP-06456162 Erection of mansard roof extension and associated works to accommodate additional HMO accommodation (sui generis use). 66 CHILTERN STREET 17/09535/FULL/PP-06491167 Use of ground floor unit as flexible use for retail/ leisure (Class A1) or (Class D2). 7 SEYMOUR PLACE 17/009072/FULL/PP-06416807 Use of basement and ground floor to a nail bar (sui generis) and installation of external lighting to front elevation. 126 BAKER STREET 17/07802/TCH/PP-06349297 Use of an area of the public highway measuring 1.9m x 7.0m for the placing of 4 tables and 14 chairs in connection with the adjacent coffee shop. Comment: Should the Council be minded to consent this application then the Association recommends a temporary permission to ensure there is no detriment to the amenity. Use of the public highway measuring 0.8m x 9.5m and 0.8m x 2.5m for the placing of six tables, five benches and two barriers in two areas in connection with the adjacent coffee shop. Erection of single storey rear ground floor extension, including full length balcony at first floor level in connection with the residential use. Installation of new plant within an acoustic enclosure within internal lightwell at basement level, installation of a quench pipe from basement to first floor level within brick enclosure. Internal alteration to basements at 86 and 88 Harley Street including enlargement of existing openings and provision of a door between 86 and 88 Harley Street. Erection of rear extension at second floor level and erection of roof extension to form new third floor in order to enlarge dwelling (Class C3). 12 MARYLEBONE MEWS 17/08882/FULL/PP- 06438364 Installation of a entrance door and replace the existing garage door with a window. Use of rear flat roof as second floor as a terrace. Objection: The proposed roof terrace will impact adversely on neighbouring amenity, directly overlooking rear gardens and residential properties to Wimpole Street. Erection of a new single storey roof extension to create four residential units (Class C3) and associated plant. Creation of three new terraces at new fifth floor level. (Site includes 9-11A Weymouth Street and 60A Portland Place) (Part of a land use swap with 142-146 Harley Street). · The additional roof storey is inappropriate in the context of the existing building and its neighbours. The original design of the street sought to have a variation in terms of the roofscape, which would be lost in these proposals. It will appear bulky and monotonous in all the views where it will be seen, i.e. from all of the surrounding buildings. In addition to these numerous high-level views, there are also street-level views from both sides of Hallam Street and the junction of Weymouth Street and Great Portland Street, and in these views the roof will be appear bulky and overbearing. · The changes to the rear have sought to overcome the problems of having a sheet extension, but has resulted in a roof form which would appear alien and unsatisfactory. · The building is already amongst the taller and more imposing buildings in the area, and the additional height and bulk will make the building appear too tall for its context and somewhat overbearing. In bringing the same design of roof across all of the Weymouth Street properties, there is an attempt at homogenising this group of buildings which is to their detriment. This approach is fundamentally harmful to the character of the conservation area. In our view the revised proposal would have a harmful impact on the conservation area and we can see no public benefit which would make this harm necessary. The proposals are contrary to the NPPF (paragraph 134) and to DES6 and DES9 of the Council’s own policies. Roof extension and front extensions at first and second floor levels to provide 2x2 bedroom residential units and additional office floor space plant room enclosed by acoustic louvre to new roof level, extension of rear external staircase/fire escape. Use of the basement, ground and ground floor mezzanine and first floors as three residential units (Class C3) and associated internal and external alterations to include plant at rear first floor level linked to 17/06996/LBC. Installation of air conditioning plant to existing roof level acoustic enclosure and existing roof level plant room at 16-17 John Princes Street at roof level. Use of an area of the public highway measuring 1.7m x 7m for the placing of 4 tables and 14 chairs and 2 barriers in connection with associated coffee shop. Use of basement and ground floors as residential maisonette (Class C3) and associated works. Installation of double glazed, bi-folding doors and air conditioning unit at sixth floor level. Use of the public highway measuring 1.75m x 8.1m for the placing of 8 tables, 16 chairs and 2 parasols in connection with the existing ground floor use. - Consideration needs to be given to the repositioning of the existing air conditioning units indicated at first floor. - Proposals for the maintenance access are unclear – will a guard rail be required around the roof? BASEMENT AND GROUND FLOOR FLAT 74 PORTLAND PLACE 17/06801/FULL/PP-06272633 Erection of part single and part two storey rear extension at basement and ground floor level to enlarge dwelling (Class C3). Use of basement as studio flat (Class C3) and alterations to side and rear basement level to install replacement window and railings. (Linked to 17/06924/LBC). - Westminster SPD on basement design indicates that the addition of railings must not harm the appearance of the building. It is understood that this building is listed as a pair, and should the council be minded to grant consent, consideration should be given to the change in appearance of only one of these buildings. - A large area of what appears to be historic wall is to be removed within the proposals however the heritage statement does not detail why this is necessary. Erection of a two storey roof extension to provide four additional residential dwellings (Class C3). - The increased height and bulk would exacerbate the already harmful appearance of the building. - Only part elevations were available online and so the full proposed elevations could not be viewed in comparison with the full existing elevations. nstallation of triple sash windows with timber spandrel. Replacement garage doors in painted timber, and creation of utility room from part of the North garage. Use of an area of the public highway measuring 5.6m x 1.08m for the placing of 2 tables and 3 benches in connection with the existing ground floor use. Detailed drawings pursuant to condition 4 of planning permission dated 19 September 2016 (RN:16/06482); Namely details of the replacement sash window. Internal refurbishment on the first floor from a 2-bedroom layout to a 1-bedroom layout. Renewal of use of the public highway for placing of two tables, four chairs and two barriers in an area measuring 1.4m x 2m in connection with the ground floor use at 27A Devonshire Street as an A1 Retail use. Variation of condition 1 of planning permission dated 06 June 2017 (RN: 16/05491) for the Demolition and re-development to provide four dwellings including external terraces on the western elevation to two dwellings and the installation of 8 air conditioning units. NAMELY to amend the approved drawing numbers to enable revisions to front and rear windows, relocation and addition of rooflights, relocation of roof hatch and internal alterations. Variation of Condition 5 of planning permission dated 6 November 2015 (RN: 15/08252) which in itself varied Condition 5 of planning permission dated 21 November 2013 (RN: 13/09716) namely, to permit the use of the public highway for the placing of tables and chairs for a continued period until 31 October 2017; NAMELY to allow further temporary permission for the placing of tables and chairs on the public highway. Display of illuminated fascia sign measuring 0.30 x 4.20 and an internal hanging sign measuring 1.20 x 1.20 above the front entrance. Installation of canvas awning in a cassette with logo. Comment: The only issue we see to highlight here is the relationship between the new layout and the chimney breasts on second and third floors. In both cases, although not ideal, we think that an appropriate balance has been struck between the needs of any modern home, the practical requirements of drainage, and the integrity of the heritage in this house. Regarding the second floor in particular we would suggest that detailed drawings are required as a condition to show that the bathroom partitioning has a minimal effect on the adjacent fabric. 17/05711/FULL/PP-06147149 Increase in height of the roof at 3rd floor level alterations to basement and facade in connection with the use of the premises as an Art Gallery and studio/ office (sui-generis). 17/04201/FULL/PP-06069525 Replacement of the entrance door.|cr||cr|Existing recessed canopy is to be removed to allow entrance glazing to be increased in height|cr||cr|Existing projecting entrance canopy is to be refurbished and soffit lighting added to it. 17/06211/LBC/PP-06190367 Internal alterations at all floors including replacement of front door and refurbishing the pavement vaults. 17/06104/FULL/PP-06218923 Installation of a new shopfront and new aluminium and glazed screens. 17/05218/FULL/PP-06043175 Demolition of the existing building and erection of a replacement building comprising basement, lower ground, ground, plus nine storeys for use as offices (Class B1) at lower ground, part ground and first to ninth floors and ancillary flexible Class A1/A2/B1 use at part ground floor; associated plant at basement levels and roof level; associated hard and soft landscaping. 1. Height, Scale and Mass: The building is considered too high and out of scale with its immediate and wider context. The additional height proposed would have a significant detrimental impact both on neighbouring properties in Knox Street and Upper Montagu Street and on the wider Portman Estate Conservation Area. The proposals should be revised to significantly reduce the height of the scheme. 2. Design Quality: The proposals are considered inadequate in terms of design quality and would harm the Portman Estate Conservation Area and the setting of local listed buildings. The existing building has many qualities and features, as highlighted in the Twentieth Century Society's objection, and in our view the quality of the current proposal does not justify its demolition. The Marylebone Association welcomes exemplary contemporary architecture and the proposals fall far short of this standard, both in the quality of the elevations and the level of detail and information provided. The architectural expression is without sufficient distinction and is not deemed to complement the local character of the area. 3. Impact on adjoining properties on Knox Street and Upper Montagu street. The overbearing nature of the proposed scheme would have a significant detrimental impact on neighbouring properties to the South and would harm the outlook and significantly increase the sense of enclosure from these properties. This is a direct result of the scale and bulk of the proposals. There would also be a harmful increase in overlooking from the rear of the proposal over the residential properties to the South. The building fronts the Marylebone Road and the existing building main entrances are from Marylebone Road. The Association is concerned that the proposed entrances onto Upper Montagu Street and Knox Street will have a significant increase in foot traffic and a detrimental impact on the quiet enjoyment of nearby residential properties. 5. Ground floor uses: There is concern over the proposed ground floor uses impact onto the quiet enjoyment of residential properties on Upper Montagu and Knox street. 6. There is significant local concern over the impact of servicing and the controls to avoid detrimental impact on neighbouring properties and traffic, especially on Knox Street. 7. There is significant local concern over the impact of construction on local traffic and the quiet enjoyment of neighbouring properties in the redevelopment. We request that the Association is consulted in the event of a consent in the development of the CMP prior to the discharging of any associated condition. 17/06076/FULL/PP-06217200 Installation of double glazed, bi-folding doors and air conditioning unit at sixth floor level. Objection: The Marylebone Association does not support comfort cooling to residential properties. The proposed AC unit is not integrated within a holistic architectural proposal and no design/materials are described for the required acoustic box. 17/07166/FULL/PP-06302681 Replacement of 2 sculptures by the artist David Breuer-Weil. 17/07279/FULL/PP-06291166 Change of use of unit 1 at 2nd floor level from ancillary storage, reception and staff facilities to a 2 x bedroom residential flat (Class C3). 17/06575/FULL/PP-06249804 Use of lower ground, ground, first, second and sixth floors of 1-2 Welbeck Street as dual / alternative use as office (Class B1) and/or medical use (Class D1). Associated alterations to Welbeck Street facade; and installation of plant to the roof and to the rear elevation. 17/06852/TCH Use of the public highway for the placing of 10 tables and 20 chairs in two areas, measuring 3.8m x 1.55m and 4.8.m x 1.55m in connection with the existing ground floor restaurant use. Declaration of interest – The Association would like it noted that a member of their planning panel has links with this application. This member has not been involved in making the submission below. 17/07261/FULL/PP-06256274 Use of commercial car park at lower ground floor level to (Class D2) gymnasium in connection with the erection of a new ground floor front facade and entrance on Beaumont Mews and installation of plant. 17/06738/FULL/PP-06244998 Dual/alternative use of the basement, ground, 1st, 2nd, 3rd and 4th floors as either office (Use Class B1) or education (Use Class D1). 17/07273/FULL/PP-06309431 Variation of condition 1 of planning permission dated 21 February 2017 ( RN 16/07989/FULL) for the variation of Condition 1 and removal of Condition 4 of planning permission dated 30 March 2016 (RN: 14/09419/FULL) for refurbishment of existing building, including demolition works and alterations to the rear, installation of services at new basement level, removal of roof plant and erection of roof extension at main roof level in connection with the use of part lower ground and part ground floor levels for Class D1 use and 25 residential apartments (Class C3) at part lower ground to seventh floor levels. Balconies from third to sixth floor level to the rear with terraces and plant located within an acoustic enclosure at lower ground floor level and other minor external alterations to the front facade. Namely, removal of condition 4 to enable a revised design for the roof extension and to vary the approved drawings to allow changes to the roof slope to address rainwater issues, changes to cladding of the balconies and canopies, inclusion of new mezzanine basement level, changes to the layout of mural apartment 2.04, relocation of cycle parking, entrance doors to be bronze faced, enlargement of windows within the front lightwell and minor reconfiguration of rooms and servicing spaces from RN 16/07989/FULL. NAMELY, to allow alterations including a revised design for the roof extension. 17/06551/FULL/PP-06226432 Variation of condition 1 of planning permission dated 23 June 2015 (RN: 14/10743/FULL) for the Demolition of rear facade of Nos. 96-98 Baker Street and front and part rear facades of No. 14 Sherlock Mews, use of first to fourth floors of Nos. 96-98 Baker Street as eight residential flats (Class C3), amalgamation of flats at first and second floors of No. 14 Sherlock Mews into a maisonette (Class C3), erection of replacement shopfronts to Baker Street facade, erection of replacement rear facade to Nos. 96-98 Baker Street, erection of replacement front facade to No. 14 Sherlock Mews, alterations at roof level, and other associated external alterations. NAMELY, to change the window frames on the rear elevation from anodised bronze to polyester powder coated aluminium. During construction; In order to mitigate, in so far as reasonably practicable, the adverse affects of construction on neighbouring properties, The Association recommends the provision of robust Construction Management and Site Waste Management Plans. During occupation; The Association recommends the provision, by the applicant, of a detailed Operational Management Plan, setting out mix of retail uses, hours of operation etc. With regards to the retail tenants, The Association welcomes the applicant’s stated aim of curating a distinctive tenant roster beyond the usual suspects. In this respect we would seek a commitment and guarantees as to the proposed number/ ratio of independent operators. Whilst we acknowledge that efforts have been made to reduce the height, it is felt that Building C’s height and massing is still bordering on oversized both in terms of height and depth. 17/03972/FULL/PP-06040505 Installation of revised acoustic enclosure to air cooled condenser units located at first floor over a ground floor rear lightwell. 17/03947/FULL/PP-06027026 Demolition of existing 4th floor level and rear part of 3rd floor level to create a new sheer storey to the rear of the building and a new mansard roof extension to provide additional Class B1 office floorspace. Removal of existing front entrance steps at 24 Portland Place and installation of new sesame stair lift, external alterations to the rear of the building and installation of new plant at roof level of the building and within the existing vault. 17/04100/TELCOM/PP-06062537 Replacement of 3no. telephone kiosks with a free-standing internet, Wi-Fi, telephone and advertising structure. 17/03231/COFUL/PP-05976567 Alterations to shopfront to widen entrance. 17/01613/TCH/PP-05857821 Use of an area of the public highway measuring 6.10m x 2.30m for placing of 6 tables and 12 chairs, and 3 planters in connection with the use of the site. 17/03621/FULL/PP-06019173 Excavation at rear lower ground floor level in connection with the change of use of the entire lower ground floor level to Class D1 medical use, reconfiguration of existing residential units and minor external alterations to the building including replacement windows (part of a land use swap with Suites B&C , 9 Weymouth Street) linked to 17/03625/FULL. 17/04245/FULL/PP-06072799 Installation of 3no. air conditioning condensing units at roof level and internal alterations comprising of the installation of underfloor heating at ground, first and second floor levels. (Linked to 17/04246/LBC). 17/03483/TCH/PP-06011374 Use of an area of the public highway measuring 15.8m x 3.1m for the placing of 44 chairs and 22 tables, one waiter station and 2 screens in connection with restaurant use. 17/03639/FULL/PP-06025920 Installation of replacement double glazed windows, bi-folding doors and air conditioning unit at sixth floor level. 17/05226/FULL/PP-06069448 Use of third and fourth floors as medical use (Class D1) (part of a land use swap with Stone House, 9-11 Weymouth Street). 17/05237/FULL/PP-06146947 Demolition of existing building and redevelopment behind a retained facade to provide a new building including double-height glazed rear extension and new 4th floor mansard, for use as a single dwelling house (Class C3). Declaration of Interest - The Association would like it noted that a member of their planning panel has links with this application. This member has not been involved in making the submission below. 17/03218/TCH/PP-05990166 Use of an area of the public highway measuring 12888mm x 4442mm for the placing of 4 tables and 8 chairs in connection with the existing ground floor use. 17/04569/CLEUD/PP-06094930 Use of ground floor (with the exception of hallway to upper floors) as commercial car parking (Sui Generis). 17/03361/FULL/PP-05960519 Erection of a roof extension to create additional office (use class B1) floorspace. 17/04882/LBC/PP-06121188 Replacement roof coverings and provision of roof insulation, renewal of dormer window and rooflight to main roof and lower flat roof, removal of defective rooflight to upper flat roof, installation of shingle bed and french drain to courtyard, external repairs and redecoration. 17/04631/FULL/PP-06071812 Replacement of existing trading kiosk at the junction of Bird Street/Oxford street. 17/04569/CLEUD/PP-06095930 Use of ground floor (with the exception of hallway to upper floors) as commercial car parking (Sui Generis). 17/03451/FULL/PP-06008548 Variation of Condition 5 of planning permission dated 15 May 2016 (RN: 16/01013) for use of the public highway for the placing of three tables, six chairs and two benches on Wigmore Street measuring 20m x 1m in connection with the existing ground floor use; NAMELY to continue use of pavement for the placing of tables and chairs until 31st May 2019. 17/04914/TCH/PP-06070318 Use of two areas of public highway measuring 3.8 metres by 6.5 metres and 1.0 metre by 7.3 metres for the placing of 6 tables, 24 chairs, 5 barriers, 2 umbrellas, 4 barrels and 8 stools, with associated screens and two umbrellas. 17/05041/FULL/PP-06118212 Installation of new shopfront. 17/05022/LBC/PP-06132993 Works to the front elevation including removal of defective render and replacing with lime render, and works to the side elevation comprising removal of the internal plaster finish at lower level between the ground and first floor and replacing with a lime render. 17/04535/FULL/PP-06095999 Erection of an external entrance canopy. The canopy externalises and brings onto the street activities associated with the hotel that cause disturbance to the local community and could and should be more sensitively dealt with within the courtyard, which would have less of an impact on the neighbouring community. If the canopy is essential to the operations, in addition to the recently consented gate house, if it were within the courtyard it would have a lesser impact. While the design is simple and discrete, it does obscure the view of the rear building from the public realm. 17/02116/FULL/PP-05502732 Alterations and decorations to the facades, Refurbishment of the existing metal railings. New double glazed sash windows to replace existing single glazed sash windows. Relocation of the main entrance from the light well at lower ground floor. 17/02184/FULL/PP-05899555 Installation of a replacement door and surround within the front basement lightwell. (Linked Case: 17/02185/LBC). 17/02211/FULL/PP-05879961 External alterations including the installation of air conditioning condenser units from first to fourth floor level with associated vents /air bricks on the front and rear facade, five replacement air conditioning condenser units on the rear first floor flat roof, replacement plant at rear second floor level, internal alterations on all floor levels. 17/01436/FULL/PP-05852095 Installation of a new shopfront. 17/02233/TCH/PP-05906448 Use of the public highway for the placing of three tables and 12 chairs in an area measuring 2m x 8m in connection with the existing unit at basement and ground floor level. 17/01843/FULL/PP-05784792 Renewal of permission dated 15 April 2014 for continued use and development of 12 Stratford Place for mixed Class B1/D1 institutional use incorporating office, education, conference, meditation, community and faith uses; including incorporation of the site to the rear at 12a Stratford Place and amendments to the rear of the building to provide a new extension at lower ground, ground and first floor levels for mixed Class B1/D1 institutional uses with ancillary residential accommodation, plant, storage, service and cycle storage spaces. (Linked Case: 17/01844/LBC). 17/01754/FULL/PP-05860842 Retention of two commemorative car park plaques at ground floor level on east (internal) wall of the car park entrance on Paddington Street. 17/02652/LBC/PP-05941680 Installation of a replacement balcony at rear first floor level. 17/02002/FULL/PP-05888440 Installation of replacement windows and exterior doors and relocation of gas meter, all at basement level. 17/0490/FULL/PP-0908551 Use of first to fourth floors for medical purposes (Class D1). (Part of land use swap with (Suite I) lower ground and ground floor level, 82 Portland Place RN:17/02489/FULL). 17/01980/FULL/PP-05773960 Installation of a 3.5m long steel access gantry sited at the west end of the north aisle roof on to the west end roof. 17/00797/FULL/PP-05783807 Alterations to existing windows at 3rd and 4th floor levels. 17/01952/FULL/PP-05883016 Variation of Condition 1 of planning permission dated 6 April 2016 (RN: 16/00810/FULL) for Variation of condition 1 of planning permission dated 19 August 2015 (RN: 15/04553/FULL) which in itself varied condition 1 of planning permission dated 3 March 2015 (RN: 14/10315) for "Use of the building as a single family dwelling (Use Class C3). Demolition of the existing mansard roof structure and erection of a single storey mansard with a terrace at the rear and the installation of plant on the new terrace with associated screening. Creation of a terrace with associated landscaping at rear ground floor level and a balcony at rear first floor level. Internal alterations at all floor levels to include the installation of a new lift and excavation to lower the basement floor level'; namely alterations to roof terrace layout, installation of new antennae and alterations to the fenestration at ground floor and rear roof level and internal alterations at all floor levels including alterations to staircase"; namely, installation of a new timber sash window to the rear elevation at third floor level and amendments to glass enclosure at fourth floor level. Namely, to vary the approved drawings to allow the omission of new rendered wall on the fouth floor terrace and replacement with a cedar screen. 17/02762/FULL Replacement of tiles on the front steps and landing with black and white mosaic tiles linked to 17/02455/LBC. 17/00269/FULL/PP-05750114 Installation of replacement handrails to the rear first floor roof terrace and internal alterations. (Linked Case: 17/00270/LBC). 17/02724/LBC/PP-05945596 Removal of condition 8 planning permission dated 21 December 2016 (RN 16/09421/FULL) for the erection of extension to mansard roof and internal alterations. NAMELY to remove the restrictive condition in relation to the single glazing on the basis that this goes beyond the remit of the application and that it is unreasonable to retrospectively apply this restriction on a roof addition which already has double glazing and is not original to the listed building. 17/02805/FULL/PP-05922394 Installation of 'visitor' sculpture in the open space in centre of Cavendish Square. 17/02702/FULL/PP-05947113 Installation of replacement windows at basement level. 17/02505/TCH/AP-00005893-001 Use of an area of the public highway measuring 2.1m X 4.5m for the placing of 2 foldway tables and benches in connection with the existing ground floor use. 17/00883/FULL/PP-05806602 Installation of replacement of rooflights and railings at second floor level. 17/00890/LBC/PP-05807132 Internal alterations to repair lath and plaster to ground floor and first floor ceilings including new ceiling rose to the rear room on the ground floor and replace section of first floor parquet flooring and repair the remainder. 17/00895/FULL/PP-05786749 Variation of condition 1 of planning permission dated 17 January 2017 (RN: 16/11014/FULL) to allow a more traditional link between the existing roof pitches and to retain original chimney breast and alcove; non-original cupboards removed. Comment: The wording of the application states that this is a retroactive application, however the existing front elevation and garage doors in photographs and street view do not resemble the proposed doors and elevation. 16/11905FULL/PP- 05618572 Installation of 2 no. new rooflights. Replacement of existing single glazed timber casement windows with hardwood double glazed sliding sash windows. Installation of a juliet Balcony and alterations to the front elevation of the property. 17/01947/FULL/PP-05883609 Installation of replacement windows within the rear lightwell. 17/02025/FULL/PP-05822827 Variation of Condition 1 of planning permission dated 29 April 2016 (RN: 14/12563/FULL) for Demolition of the rear extension to the building at lower ground, mezzanine, ground and first floor levels and rebuilding to include the creation of a terrace at rear first floor level. Excavation of additional basement levels and installation of plant at main roof and basement level all in association with the use of the property as a single family dwelling (Class C3). Namely, to vary the approved drawings to allow alterations on the fourth floor that involves changes to the mansard curved wall to make way for two proposed dormers. (Linked Case: 17/02084/LBC). 17/02005/FULL/PP-05860504 Installation of replacement of windows and balcony doors at front elevation and replacement windows to rear elevation and dormer windows to the rear roof slope. 17/01757/FULL/PP-05838923 Installation of access ramp at entrance of the building to allow disabled access. No Objection: The Association welcomes the creation of new public space (albeit under private ownership) in the form of a new internal square and pedestrian street creating new links. However, whilst the entrance into the heart of the development from Baker St is announced with large canopies over 3 open façade bays, there is some concern that the route through, with glazed automatic sliding doors and flanked by office receptions on either side, may not always appear open and inviting to all. In this respect, we would welcome some more detail with regards to the proposed automatic door to Building C from Baker St.
•During construction; In order to mitigate, in so far as reasonably practicable, the adverse affects of construction on neighbouring properties, The Association recommends the provision of robust Construction Management and Site Waste Management Plans. •During occupation; The Association recommends the provision, by the applicant, of a detailed Operational Management Plan, setting out mix of retail uses, hours of operation etc. With regards to the scheme’s massing, it is felt that Building C is bordering on oversized, both in terms of height and depth. Further, we note that in setting out the new building lines for building C, the applicant has gained up to 1.1m, in some areas, beyond the adopted highway boundary and existing buildings facades. This seems excessive, particularly in light of the applicant’s inability to provide sufficient short term safe cycle parking on site with a shortfall of 66 spaces (only 32 spaces provided due to insufficient space). Perhaps with wider pavements (as existing) and a slightly reduced building depth, the scheme could be made compliant with London Plan guidelines regarding short stay cycle provision. Finally, we note the provision of less than 20% affordable housing (none of which is Social Rented or Affordable Rented) against Westminster’s requirement of 30%. 17/01427/LBC/PP-05810107 Internal alterations to provide an additional bedroom. 17/01376/FULL/PP-05824643 Illumination of the buildings architectural elements. 17/01868/FULL/PP-05853270 Use of the ground to third floors as a permanent (Class D1) educational use (part of a land use swap with 110 Marylebone High Street). 17/01352/FULL/PP-05780092 Installation of facade lighting to Old Quebec Street elevation. 17/00646/FULL/PP-05780875 Alterations including construction of external plant deck above rear second floor roof to accommodate new air handling unit and four air condenser units and installation of associated ductwork to rear elevation, alteration to ground level louvre. 17/00477/FULL/PP-05768985 Installation of new shopfront with heaters to front elevation. Installation of new windows and removal of a step to side elevation. 17/00989/FULL/PP-05798694 Variation of Condition 3 of planning permission dated 21 April 2015 (RN 14/11015/FULL) for, 'Part redevelopment with alterations and extensions for restaurant (Class A3) and retail (Class A1) use on basement and ground floors with six flats at first, second and third floors and plant to first floor rear level', in order to alow an extension to the terminal hour of the restaurant over basement and ground floor level on Monday to Saturday nights from 00.00 to 00.30 (Sundays, Bank Holidays and other public holidays would remain unchanged). 17/01002/FULL/PP-05803716 Amalgamation of Flats 225 and 232 Bickenhall Street into single flat (Class C3). 17/01233/FULL/PP-05836799 Installation of six antennas and two equipment cabinets with associated equipment at main roof level. 17/01598/FULL/PP-05739801 Use of third and fourth floor for medical purposes (Class D1). 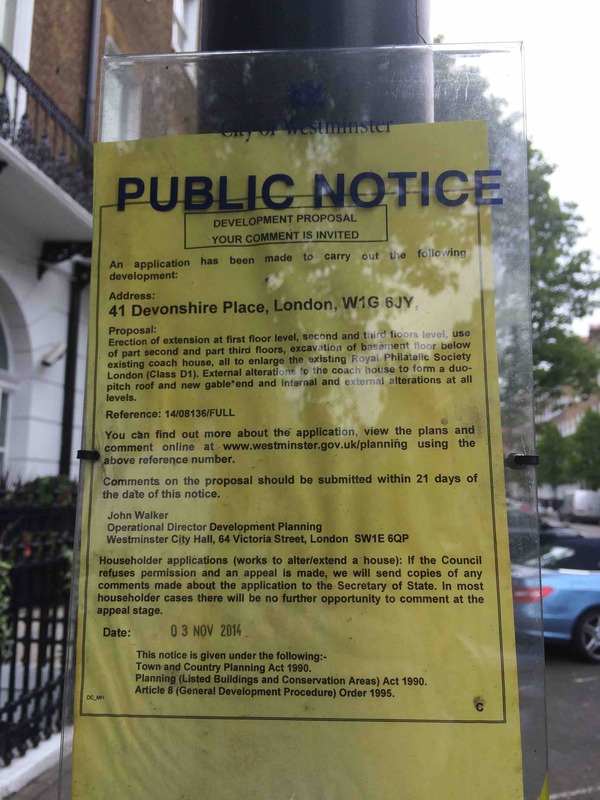 (Land Use Swap with 14 Wimpole Street (Ref: 17/01596/FULL)). 16/11905/FULL/PP-05618572 Installation of 2 no. new rooflights. Replacement of existing single glazed timber casement windows with hardwood double glazed sliding sash windows. Installation of a Juliet Balcony and alterations to the front elevation of the property. Objection: Substantial alterations are proposed to the building’s front elevation so as to significantly alter its character. In place of the existing composition the applicant proposes a bland and generic elevation without any reference to or evidence of comparable elevations on the mews or indeed any attempt to justify the design. 17/02150/FULL/PP-05608178 Use of the building to Class D1 educational use for a period of 3 years. 17/01970/LBC/PP-05881516 Installation of new cast iron air brick at third floor level within the rear facade in connection with a residential (Class C3) use at third and fourth floors. 17/02030/LBC/PP-05890667 Internal alterations to the third floor and change of door colour to the ground floor. 17/02028/FULL/PP-05887254 Replacement windows on western elevation and enlargement of a lower ground floor window. 17/02027/FULL/PP-05886965 Variation of Condition 1 of planning permission dated 29 April 2016 (RN: 14/12563/FULL) for Demolition of the rear extension to the building at lower ground, mezzanine, ground and first floor levels and rebuilding to include the creation of a terrace at rear first floor level. Excavation of additional basement levels and installation of plant at main roof and basement level all in association with the use of the property as a single family dwelling (Class C3). Namely, to vary the approved drawings to allow new photovoltaic panels and satellite dish at roof level and the removal of a redundant roof projection. 17/02100/TCH Use of the public highway for the placing of 4 tables and 16 chairs and 4 parasols in an area measuring 2m x 11.8m in connection with existing public house. 17/01347/FULL/PP-05682782 Alterations to entire building including the erection of a mansard roof extension, new plant areas and extract ducting to the backland building, and erection of a building fronting St. Vincent Street comprising ground to fourth floors. Use of the rear lower ground and part ground for restaurant (Class A3) use (accessed from St. Vincent Street), use of part lower ground and part ground as a shop (Class A1), use of part lower ground, part ground, part 1st, 2nd to 4th floor levels as office (Class B1) floorspace (accessed from St. Vincent Street) and use of part ground and part first floor levels as education use (Class D1) (accessed from Cramer Street). (Part of land use swap with 100 Marylebone Lane). We are fortunate that Marylebone Association Planning Sub-Committee consist of eight local active professional Architects/Town planners. However, from time to time conflicts of interests do arise. Where this it the case the Association's comments feature a "declaration of interest": The Association would like it noted that a member of their planning panel has links with this application. This member has not been involved in making the submission. Where an application is considered significant for Marylebone, the Association's response is agreed by the main committee.